Penelitian - New Caledonian crows (Corvus moneduloides) have shown that they can assemble tools from two or more components, a feat that was previously believed that only humans and great apes were capable of. A film by scientists from the University of Oxford shows Caledonian crows slotting pieces of rod together to create a tool long enough to extract a food reward. The birds are seen being presented with the barrels and plungers of disassembled syringes. “The finding is remarkable because the crows received no assistance or training in making these combinations, they figured it out by themselves,” said Auguste von Bayern of the Oxford University and the Max-Planck Institute for Ornithology in Germany. Four out of eight of the birds were able to partially insert the plunger to manufacture the right length of tool. One star performer, called Mango, was able to make compound tools out of three and even four parts. The birds used the tools to drag a piece of food, a grub, along a slot to an open doorway. 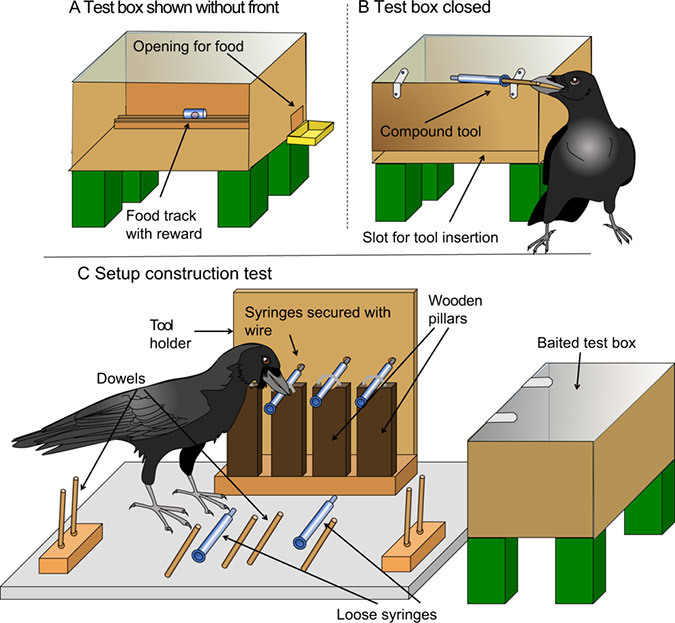 “The results corroborate that these crows possess highly flexible abilities that allow them to solve novel problems rapidly, but do not show how they do it.” Said Alex Kacelnik of the Oxford University. “It is possible that they use some form of virtual simulation of the problem, as if different potential actions were played in their brains until they figure out a viable solution, and then do it.” Kacelnik said. “Similar processes are being modelled on artificial intelligences and implemented in physical robots, as a way to better understand the animals and to discover ways to build machines able to reach autonomous creative solutions to novel problems.” Kacelnik added.